« 2007-09-07 The last cowboy? This entry was posted on Saturday, September 8th, 2007 at 3:09 pm	and is filed under Bear, Hiking, Photo, Washington. You can follow any responses to this entry through the RSS 2.0 feed. Both comments and pings are currently closed. Now you are really in my back yard. I have hiked much on the trail sections you are now on – between Mt. St. Helens and Stevens Pass. We used to go there alot and to the Enchantment Lakes with my dad in the 70’s when I was a teen. I am back at work now, after having spent 3.5 weeks in Seattle. It is strange…and it will probably be stranger for you. 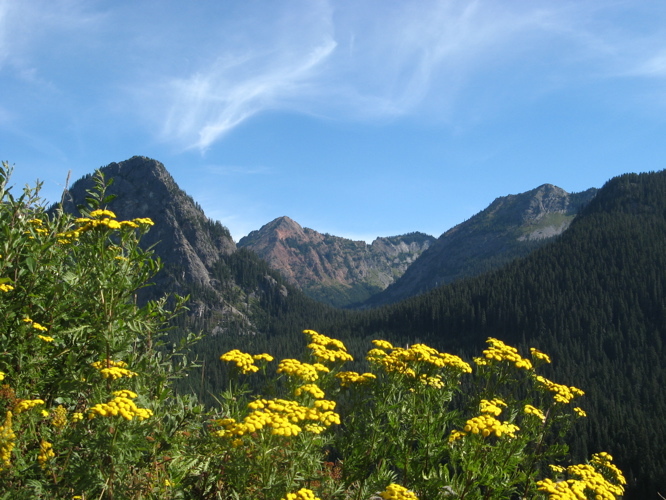 Enjoy the North Cascades – it is a gorgeous place. Thinking of you as you pass through the last challenges of the trail. Am still following your progress closely. I’m very grateful that the Fire Service computers don’t block access to your site. The trail keeps offering up spectacular and varied landscapes to challenge and inspire you.